Monopsony (if you've been wondering) is the flip side of monopoly: a market with only one buyer. Book retailing isn't quite there, but we're getting awfully close. It is the nature of chains to centralize decisions -- such as what books to offer. 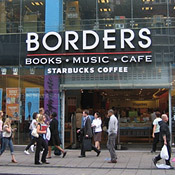 A hundred independent booksellers represent one hundred prospective outlets for an author. A chain of a hundred stores often represents just one purchaser's to-stock-or-not decision. And if for whatever reason a chain or two passes on a book? Not good for that book's prospects. What of online booksellers? I'm guessing you know that one buyer has the lion's share of that market. Even if there were more viable online ebook sellers (one of Borders' problems being they lacked a successful online presence), online sellers have yet to reproduce the browsing/serendipity feature of brick-and-mortar bookstores. It's far from clear how non-bestselling authors can draw the online eye of prospective buyers. And ebooks? They're changing the market, too, and not always in a good way. See, for example, from The Wall Street Journal: Authors Feel Pinch in Age of E-Books. Or, from Livescience.com: e-Book Piracy Surges, Says Study. As in, "Every day people type between 1.5 and 3 million Google queries for pirated e-books, an increase of 54 percent over queries logged one year ago, according to a new study by Attribute Research." I'm an SF author, and so I'm also concerned with a second consolidation: SF publishers. Of any longevity, only three magazines. Of SF book publishers with access to reasonable distribution channels, not many more. So before reaching the dearth of bookstores, there's the gauntlet to be run of too few publishers.